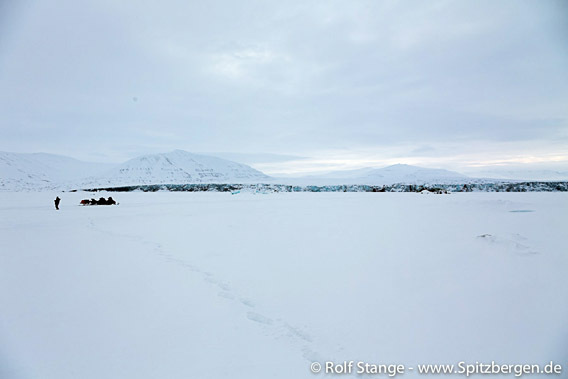 Two snow mobiles broke through the surface of the fast ice in Mohnbukta at the east coast of Spitsbergen. Nobody suffered any injuries. Both belonged to a group of nine snow mobiles with locals from Longyearbyen out on a private tour. According to officals, the group had been careful and exercised good practice. Shortly before the incident, they had measured the ice thickness to be close to 70 cm, a value that usually indicates safe conditions. As the individual drivers had kept sufficiently large distance between their vehicles, following ones could avoid driving into the danger zone. The drivers of the snow mobiles that had broken through the surface managed to get off and onto safe ice. The group could retrieve both snow mobiles with ropes, avoiding loss of equpment and fuel in the environment. Immediately after the incident, they informed the Sysselmannen in case anyone had seen them and raised alarm. On tour on the ice in Mohnbukta on the east coast of Spitsbergen: beautiful, but never entirely risk-free. The incident, which happened yesterday (Saturday), shows that fjord ice is never an entirely risk-free environment for travelling. Even with careful behaviour, risk cannot be fully excluded. Care and quick availibiity of safety equipment (ropes and “ispigger”, kind of nails with handles or something similar that helps you in the worst case to get out from the water and back onto ice) can safe lives. I have been asked why there has been no arctic travel blog in a while. The reason is short and conclusive: I have not been in the Arctic recently. I have been in Antarctica and Patagonia – you couldn’t be much further away from the Arctic, yet very familiar! So, there has indeed been a recent and well-fed travel blog, just from the deep south and not from the high north and accordingly on a different website (antarctic.eu, click here to get there). The arctic travel blog will be continued in a few weeks from now, when we start the northern season under sail early in the second half of May. Supercool landscapes with trees? Hard to believe, but that exists! 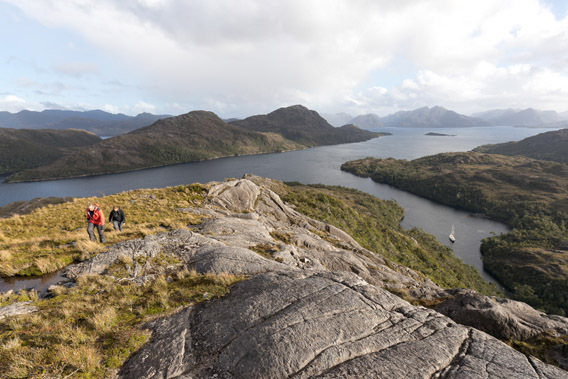 Click here to have a look at the travel blog Patagonia. But don’t worry, there is also a lot of supercool landscapes without trees in the same travel blog, from Antarctica. The Sysselmannen has decided to ban motorised traffic from the fjord ice in Tempelfjord (inner Isfjord), Billefjord (near Pyramiden) and Rindersbukta (in Van Mijenfjord). The ban is based on the assumed disturbance of wildlife by motorised traffic. All of these places are popular destinations for snow mobile trips from Longyearbyen. Ringed seals need the fjord ice currently to give birth to their offspring, and polar bears, which have been seen regularly in recent times in all these places, have accordingly an important hunting season to build up fat reserves. The authorities assume that the total disturbance by motorised traffic is too much for the wildlife to carry on with their important respective businesses. Until 01 Juni – covering the complete remaining winter season – all motorized traffic is banned from the fjord ice in these areas. There are exceptions on the shortest safe routes in Billefjord from Nordenskiöldbreen to Pyramiden, which is part of the regular trip from Longyerabyen to Pyramiden, and in Tempelfjord, making it possible to cross the ice on the shortest safe route west of Kapp Schoultz to Kapp Murdoch. Maps showing the details are available on the Sysselmannen’s website. Non-motorised traffic is not concerned. In 2018, the fjord ice has developed better than in recent years. It is the first time in several years that Tempelfjord can be crossed regularly and safely. Appearently wildlife is not much disturbed by careful, sensitive traffic by guided groups or careful individuals. Ruthless behaviour of careless individuals or groups is another matter and hard to control. The Sysselmannen reminds the public that it is everybody’s indivdual responsibility to assess the safety of the ice for traffic. 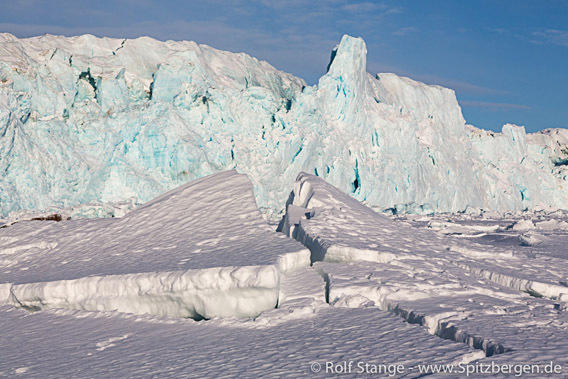 Glacier front in Tempelfjord: popular destination for excursions, but currently off limits for motorised traffic. Out now: Spectacular Antarctica postcards (limited edition)! Travel to the Antarctic once – a dream only few can realize. Everyone else continues to dream while sending postcards with spectacular pictures from the Antarctic to their loved ones. 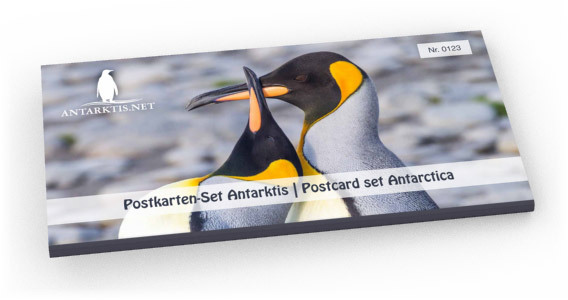 The postcards include motifs of King and Emperor Penguin, Elephant seal, a very rare “Ecotype D” Orca and spectacular landscapes on remote Antarctic islands, including a tabular iceberg that is unique and distinctive to the Antarctic iceberg form. Maybe the dream of an Antarctic trip will come true some day? 608 pages thick: the new guidebook Spitsbergen – Svalbard for the English-speaking audience has grown by almost 100 pages! All chapters have been updated with new details, especially maps. »Spitsbergen – Svalbard« has detailed information about the flora and fauna of Spitsbergen, its nature and human history and detailed chapters about all regions, fjords, islands and settlements. The various seasons are described and different ways of traveling. Routes are described in detail for popular snow mobile excursions, day hikes, long trekking expeditions and boat trips. 14 mammal species, 26 bird species and 29 flower species are described in detail and illustrated with colour photographs. Many maps within the text provide geographical orientation – these are amongst the many important improvements compared to previous editions. The polar bear risk and issues related to weapons are discussed. Detailed information about relevant legislation as well as names of all wildlife and plant species described in no less than 10 languages make the book a complete reference also for professional guides. 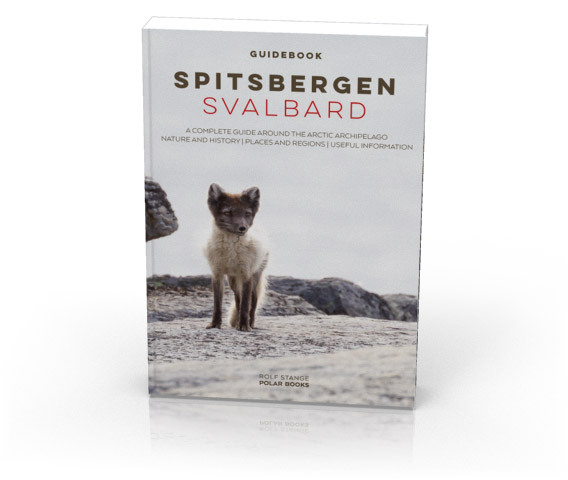 This is by far the most complete Svalbard guidebook available on the market!